Students with heavy course loads feel pressured to stay on top of their assignments. It’s three in the morning. Sophomore Jade Sebti wakes with a start. She rubs her bleary eyes to find her bed covered in chemistry notes and flashcards. She panics, worrying about how much she has left to study and how she’s going to do on her test tomorrow. Every year, the list of stressed out students gets longer and longer as more Advanced Placement (AP) classes are added to the list and college admissions become more competitive. More and more students are feeling this college pressure prematurely in their 9th and 10th grade years, as opposed to their 11th and 12th grade years. It has become an epidemic, an issue deeper than straight-“A”s that can’t be fixed by just taking easier classes. For Sebti, the pressure began early. “I started thinking about college when my older brother started thinking about college, so I was a freshman. I thought about the pressure he was going through and how one day that would be me. It made me want to push myself harder academically,” said Sebti. In most cases, junior year brings a flood of emotions and pressure because many colleges and universities tend to focus on 11th grade report cards. “College pressure became real to me in junior year because a lot of my close friends were going through the college application process. It made me start thinking about my future and what I was going to do when it was my turn to worry about it,” said senior Thomas Chin. The thought of college can weigh heavily on students. “It starts with some placement tests in 8th grade and escalates to taking AP classes because you want to get into a good college. A good college means a successful future, and that’s what people strive for,” said Sebti. In recent years, the pressure to get into a prestigious college has been coupled with the competition among students. According to Peterson’s, an organization designed to answer any and all questions about the college application process, high school graduation rates are projected to rise by 10 percent over the next few years. This means a significant increase in high school students applying to colleges. Collegedata.com’s College Admissions Tracker shows that the ratio between applicants and those accepted has changed drastically over an 8-year period. UC Berkeley’s class of 2010 boasted high acceptance rates in comparison to the number of applicants, while the class of 2018 showed a drop in acceptances and a rise in applicants. 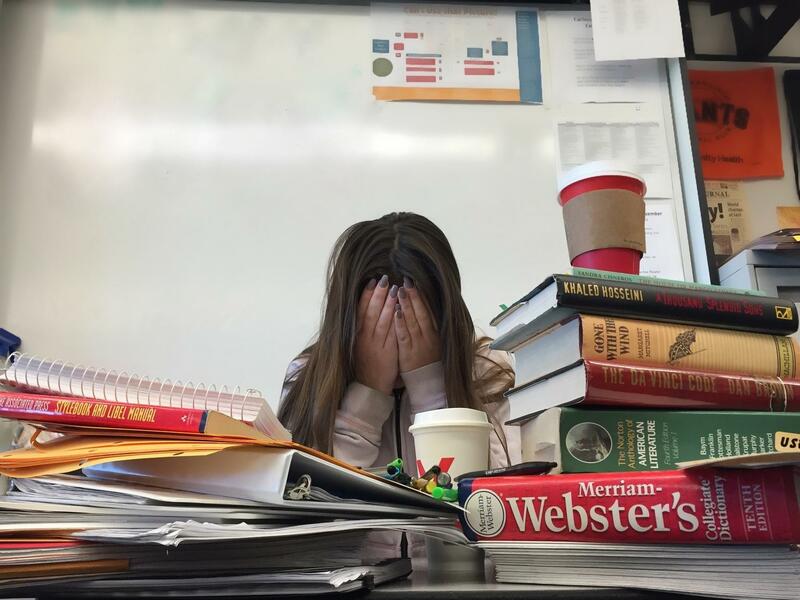 According to high school crisis counselor Shelley Bustamante, the pressure of getting into a highly-ranked four-year college or well-known university is sometimes brought on by adults with high expectations. “Some parents want their children to accomplish more than they did, so they tend to live through them. This leads to the parent pushing the kid too far in order to make sure the end goal is achieved,” said Bustamante. For senior Claire Wheeler, the pressure comes from a different place. “I want to make my parents proud, so I set high expectations for myself. It’s not always about pleasing other people,” said Wheeler. According to Sebti, the pressure she feels is personal, as well. “My parents pushed me when I was younger. Now, I push myself harder than they ever have. I think I have higher expectations for myself than they do for me,” said Sebti. But what happens when the pressure becomes too much to handle? “If there’s a moderate amount of pressure, it can be good and push us to do our best, but a lot of the time, there’s too much pressure,” said Wheeler. “Students tend to isolate themselves and start to react similarly to how one would react to a traumatic event. These reactions include changes in sleep schedules, eating habits, and behavior that leads to anxiety and depression,” said Bustamante. What is the answer, and what needs to change? “Don’t take more difficult classes than you can handle,” said Bustamante. However, knowing this can be difficult for students driven by the thought of prestigious colleges, Bustamante added that, in case of an overload of difficult classes, a support system is necessary. In any case, the struggle to control all aspects of the college admissions process is one that worries many students. This map shows the requirements for admissions for the class of 2010 and 2018. Click on a location to see the statistics for that school.